Day Trading: A common trading style in which a trader opens and closes a position within the same trading day. 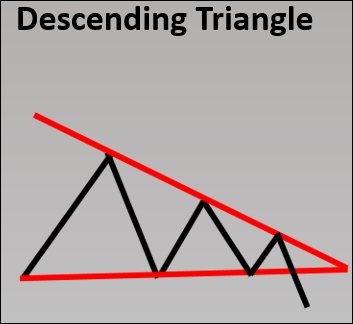 Descending Triangle: A bearish continuation pattern that consists of a support level and an overhead trend line that are converging. Once the price breaks below the support level, the stock signals a bearish trend continuation. Distribution: The selling of shares as price remains in a small range. This usually occurs after a significant move and investors are exiting their positions. Divergence: When two lines on a chart move in opposite directions. This can also refer to when an indicator and the price of a stock move in opposite directions. Bullish divergence is when an indicator is moving higher but the price is declining or sideways. Bearish divergence is when an indicator is moving lower but the price is advancing or sideways. Doji: A candlestick in which the opening and closing price are the same. It often indicates a potential reversal due to the blatant indecision and inability for bulls or bears to remain in control.